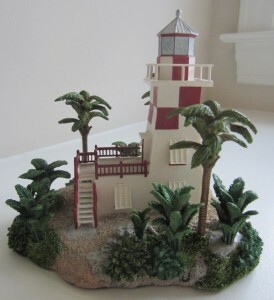 The first Harbour Lights models were introduced to the public in the Spring of 1991. The company was founded by Bill Younger who had been the first sales representative for David Winter Cottages. 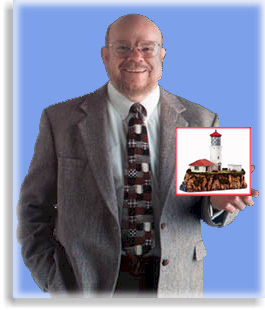 He realised he was not alone in his love for old buildings, and felt inspired to create a line of lighthouse sculptures that would accurately depict American architecture. Working closely with his wife and daughters the range was researched and developed and the original 17 models launched. The original limited editions were chosen by Bill and his family from America’s most famous and beloved sentinels. These include such historic lighhthouses as “Cape Hatteras, NC”, “Boston Lighthouse, MA”, and “Sandy Hook, NJ”. Pictured: Harbour Lights #389, Key Largo, FL this edition sold on ebay for $154.50, October 2017. The collection grew rapidly and at its height of popularity there were some seventy active editions, representing every coastal area in the United States, as well as Canada, Europe and Asia. The company created a worldwide base of loyal Harbour Lights collectors and a Harbour Lights Collectors Society was created providing news, special editions and club gifts. 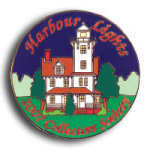 The Harbour Lights Collectors Society ran until 2009. The company was acquired by Lighthouse Marketing, Ltd in 2006, but the company ceases trading in 2010. There is an active secondary market for Harbour Lights mainly centred around ebay with some of the rarer editions such as Alligator Reef, Fl and Egg Rock Maine fetching many hundreds of dollars – click to view Harbour Lights at ebay.